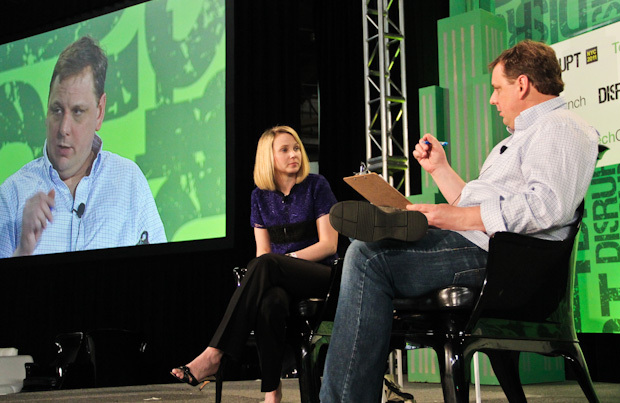 Today at TechCrunch Disrupt in New York City, Google’s Marissa Mayer sat down with our own Michael Arrington. She’s an old pro dealing with Mike — she’s actually been to every event we’ve ever put on. And she knows that as long as she has some new data to give him, he won’t push on the other, more uncomfortable things he likes to push on. Or at least, he won’t push as hard. As such, Mayer noted that Google Maps for mobile has now surpassed 200 million installs. And those are active users of the product. Perhaps even more amazing is that mobile constitutes over 40 percent of all Maps usage. And in June, Mayer says that she expects mobile will surpass the desktop version of Maps for good. Since Mayer was one of Google’s early employees, Mike asked her what the atmosphere was like now with Larry Page in as CEO and Eric Schmidt out. She noted that it was “really optimistic” and said that there’s “a lot of energy.” She said that since Google has always been focused on the product, Larry was the perfect person to come in and lead.